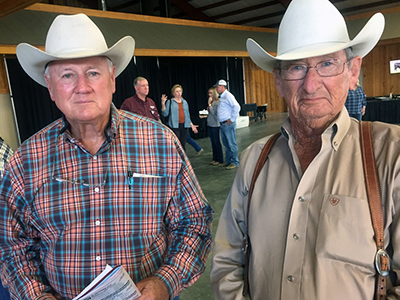 Cattlemen from the southern U.S. resoundingly endorsed the value of the Town Creek Farm genetic program at the Town Creek Farm Sale, Saturday, October 15, 2016, near West Point, MS. The sale saw 151 Town Creek Farm Bulls average $4435 and 279 Commercial Bred Heifers average $1942. The sale grossed $1,184,503. The crowd was welcomed by owner, Milton O. Sundbeck. There was a buzz in the bull pens as cattlemen described the Town Creek Farm offering as “the best set of bulls ever offered by Town Creek Farm.” That very significant acknowledgement comes in large part because of Town Creek Farm’s continuance of the Cow Creek Ranch’s benchmark genetic program and its dedication to producing a uniform, reliable, genetic-superior product. The bidding pattern of buyers respresenting 10 states and South America showed extraordinary confidence in the Town Creek Farm program adding to its reputation as one of the nation’s leading Brangus and Ultraback bull suppliers. Though cattlemen are presently wittnessing a new economy in the cattle business, bidders and buyers were still eager to heat up the bidding on quality genetics. Topping the sale was TCF Sleep Easy 426B who came with a high quality maternal background, calving ease and all-purpose features. Alabama cattleman Mike Stanley secured the sale topping herd sire for $11,000. Newcomer Rob Schaedle, Leipers Fork Cattle Co., of Tennessee had a final bid of $10,000 for the second high selling bull, TCF Rapid Reward 4891B3. The bull covered all breeding bases displaying outstanding phenotype with terrific muscle and fleshing ability. 4891B3 will be used in both seedstock and commerical applications. Heading up the volume purchasers were two long time buyers of Cow Creek genetics George Farm of Georgia and Triple S Ranch of Florida. First time buyer DCJ Ranch of Alabama rounded out the list of volume buyers. 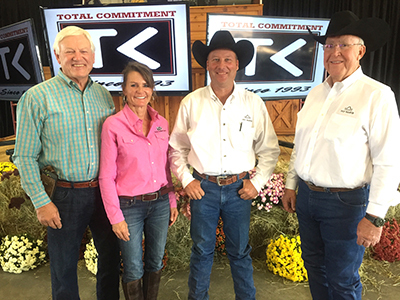 Town Creek Farm offers its customer base an opportunity to market Town Creek and Cow Creek sired heifers in the Town Creek Farm Commercail Bred Heifer Sale held just prior to its bull sale. The sale is a continuation of the previously held 18-year running Cow Creek Ranch Commercial Bred Heifer Sale. The genetically tracked heifers commanded strong interest and demand from buyers. When all were sold and done, 279 heifers sold for an average of $1942 per head. The customer-owned heifers were offered by Williamson Cattle Co., ranching in Florida and Alabama, a 19-year consignor sale consignor; River Oaks Farm, Arkansas, 18-year consignor; 17-year consignor, CP Bar Brangus, Mississippi; 12-year consignor, Megehee Cattle Company, also of Mississippi; along with eight-year consignor, Montgomery Farms, Alabama, and two-year consignor Longino Ranch of Florida. Other consigners included B&B Farm, Alabama, three-year consignor; and Lowell Dollar Farms of Georgia. Doak Lambert, Decauter, TX, was the auctioneer. pictured with volume bull buyers, DCJ Ranch of Alabama.